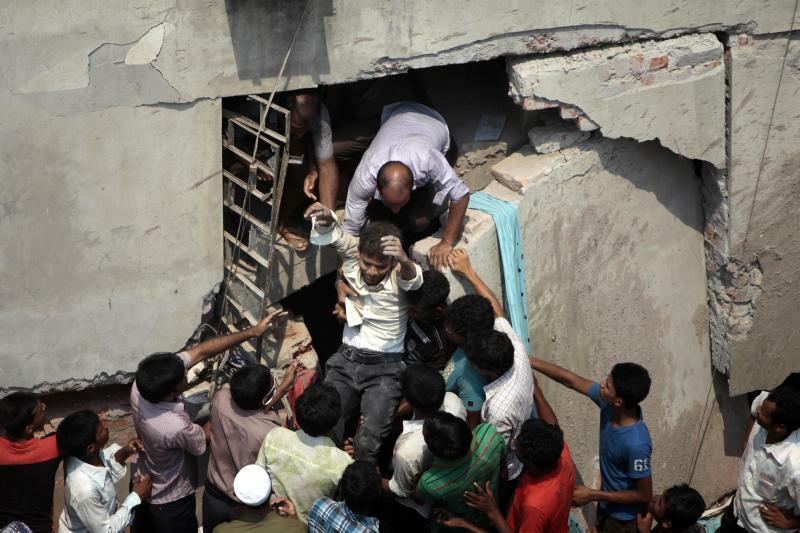 SAVAR, Bangladesh (AP) — When the cracks in the building appeared early Tuesday afternoon, a stocky man in his early 30s, a feared political operative who a neighbor says dropped out of school in seventh grade, quickly arrived at the scene in this crowded industrial suburb of the capital. 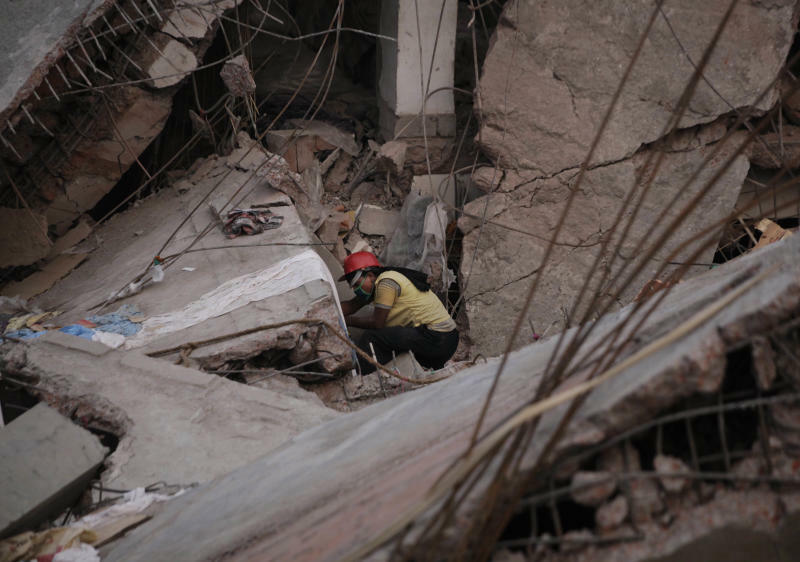 By then, fear had spread through the 3,200 people who worked in the five clothing factories that jammed the upper floors of Rana Plaza, and the handful of shops on the lower ones. Most of the workers had gathered in the street out front. Few wanted to go back in. Inspectors said the eight-story building should be closed until it could be inspected. But Mohammed Sohel Rana scoffed. "The building has minor damages," Rana, the building's owner, told gathering reporters. "There is nothing serious." The next morning, many of the building's shops and a first-floor bank remained closed. But the factories' 8 a.m. shift began as usual. About 45 minutes into the shift, the building suddenly collapsed, killing at least 362 people in a fury of falling concrete. It was the worst industrial accident in the history of Bangladesh. More than three days later, rescuers are still crawling through the wreckage, hoping to find anyone who has managed to survive so long. By Saturday, nearly all the people being carried out were dead. By that point, though, Rana had disappeared. Local media reports said he left his basement office in Rana Plaza just before the collapse, drove away and dropped from sight. He was arrested Sunday as he tried to cross the border into India. For years, though, Rana had sat at the nexus of party politics and the powerful $20 billion garment industry that drives the economy of this deeply impoverished nation. This intersection of politics and business, combined with a minimum wage of $9.50 a week that has made Bangladesh the go-to nation for many of the world's largest clothing brands, has made dangerous factory conditions almost normal, experts say. Government officials, labor activists, manufacturers and retailers all called for improved safety standards after a November garment factory fire in the same suburb, when locked emergency exits trapped hundreds of workers inside and 112 people died. But almost nothing has changed. 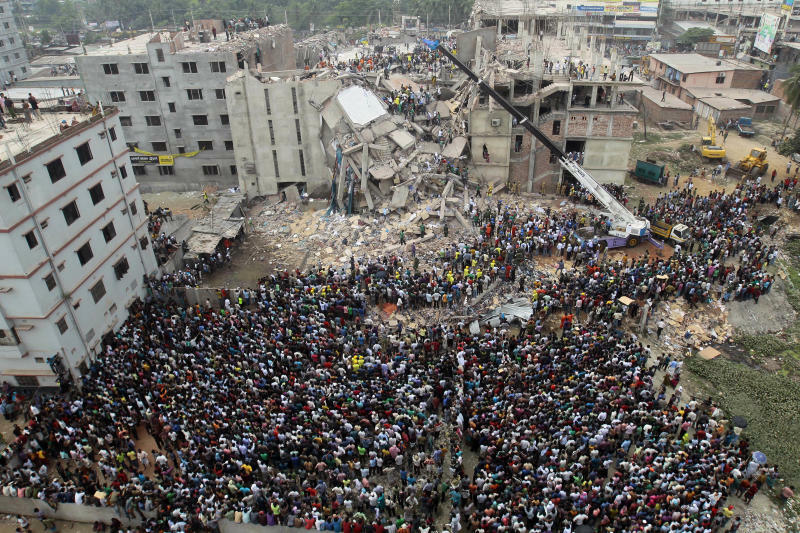 "Successive Bangladeshi governments have paid lip service to worker safety but in reality it is only the factory owners who have the ear of policymakers," Brad Adams, the Asia director for Human Rights Watch, said in a statement. "How many factory tragedies will it take before the Bangladeshi government ends its cozy relationship with powerful company owners and prioritizes worker safety?" Before the collapse, Rana was little known outside of the few blocks of his tiny empire, a grid of poorly paved streets in the crowded industrial suburb of Savar, built up over the past decade or so around hundreds of garment factories. The son of a local businessman with political connections, Rana became a neighborhood force by working as an organizer for the two political parties that have competed for power for decades in Bangladesh, according to local politicians, as well as someone who grew up near Rana and still lives in the area. While Rana is currently a leader of the youth group of the ruling Awami League, he has also worked for that party's archrival, the Bangladesh National Party. "He doesn't belong to any particular political party," said Ashrafuddin Khan Imu, an Awami League leader and longtime Rana rival. "Whatever party is in power, he is there." In essence, these people say, Rana is a neighborhood political enforcer, regularly ordering thousands of people into the streets for rallies. Most recently, Imu said, he has been working for Awami League lawmaker Talukder Touhid Jang Murad. When Murad was asked about Rana after the collapse, Murad denied any connections. The next day, Dhaka newspapers printed photographs of Murad kissing Rana on the forehead after a successful rally earlier this year. "He used to intimidate people whenever he needed them, like bringing people out for street marches in support of the lawmaker," said the neighbor, who spoke on condition he not be named, fearing Rana would send his men to beat him up after having been threatened once before. "Neighbors would avoid him ... No one wanted to upset him." Money came with his political connections, with wealth built upon a string of government-owned properties he acquired at reduced prices, according to local media reports. He built a small apartment building and a small commercial building, where a Bata shoe store is now on the ground floor. In 2010 he built Rana Plaza on land that had once been a swamp. He had a permit to erect a five-story building, but built three additional stories illegally. Until Wednesday, he lived just a few blocks from Rana Plaza, in a five-story red-brick building he owns at the end of a narrow alley. The ground floor has a hand-painted medieval scene, with an aristocratic woman, or perhaps a bride, being carried by scowling bearers in a covered palanquin. The neighbor says he is married, and has two children. The buildings indicate he is a man of considerable stature locally, but is almost certainly not a member of the country's tiny elite. After the cracks appeared in the building, witnesses say Rana quickly went to work. On Wednesday morning, he and a number of factory managers ordered nervous workers into the building shortly before the collapse, according to the neighbor, who was present at the scene, and local press reports. "I was too afraid to go inside the building. But the factory officials assured us they would also be in the factory, so there should not be any problem," said Kohinoor Begum, a factory worker who survived but whose hands were injured. Cheers went up at the scene of the collapsed building when his arrest was announced over loudspeakers. After Rana disappeared, authorities detained his his wife, apparently to convince him to surrender. What will happen to him? At first glance, the situation doesn't look good: His political allies have abandoned him, Bangladesh's most powerful garment industry association says he ignored their warnings to shut the building and the prime minister called for his arrest. But in the streets of Savar, many note that while three managers have been arrested in connection with the Tazreen fire, the factory owner remains free. Sullivan reported from New Delhi, India. Julhas Alam in Dhaka contributed to the report.